Executive Sales Leader Briefing: Are You Listening or Just Waiting to Talk? Think for a moment about the last conversation you had, whether it be on the telephone or with someone in your office. Were you quiet because you were listening or were you quiet merely waiting to jump in and state your case? Leaders listen, and not just out of showing respect; leaders listen to learn, understand and help craft a better outcome. I will argue that managers, on the other hand, may listen out of respect only long enough to find an opening for them to take control. When we are truly listening to the other person, the person who is talking knows it and the value of the discussion moves to a higher level. Leaders know this, because when a discussion moves to a higher level, the level of thinking increases with it. The easiest way to move the conversation as a leader to the next level is by not just taking the time to listen, but by engaging the other person by building on what they say. The value of the question or the comment you make is the real value. Base it on what they said to you. The value of the discussion is the conclusion you come to collectively and not the shallow statement you wanted to make. When we raise the ability of those we lead to think for themselves at a higher level, we have done our job of being a leader. 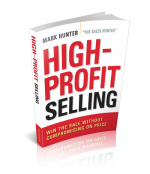 PrevPreviousWill There Ever Be a Winner Between Marketing and Sales?